I’ve spent a large part of my professional life at Access Copyright. I’m often asked by publishers and creators what keeps me going, especially through the challenging times. The answer is simple: it is my privilege to work on behalf of Canadian creators and publishers to make sure their rights and the value of their work are both recognized. In the last few years, workplace gurus have talked a lot about the importance of alignment between your personal values and your work. I feel like I’ve been blessed; this is meaningful work and I cannot imagine doing anything else. Late last year, I testified before the Standing Committee on Canadian Heritage for the Study of Remuneration Models for Artists and Creative Industries. I had the honour of being accompanied by one of Canada’s most prolific Young Adult writers, Sylvia McNicoll. Please take a moment to hear her opening statement before the Committee. During the question period, one of the MPs asked if there might be a middle ground, a way to protect writers and ensure learners in the public sector have access to high quality materials, given limits to funding. It’s a question I’ve heard (and answered) many times. Sylvia’s response below truly gets to the heart of the issue. I think it’s just obvious that immediately tariffs have to be enforced . That was never a compromise, to say that you could have an educational exemption and not pay anything. That’s full-handed giving them free…. This has been going on for close to five years. Different schools opted out at different times. They believe now that they are entitled. It will be very difficult. They have no knowledge of ever paying for photocopying or for digitally reproducing materials. We need to get the fines, the tariffs, in place, and then we need to rein in this exemption. If I could add something, the system of collective licensing was created precisely so that the entire book doesn’t have to be bought all the time. It provides that means of accessing without having to pay the full price of all books all the time for every student. It’s also important to keep in mind—because I think that because of all of the noise we hear about this and all of the efforts that are made to evade having to pay—that we have the sense we’re talking about incredible sums. In the elementary and secondary sector, we’re talking about $2.41 per student per year. Then they could do the copying of their chapters and their 10% to their heart’s content. It’s $2.41 per child per year, and the ministers are still not paying. In post-secondary, at most we are talking about $26 per student per year. It’s the price of a pizza. In college, we are talking about $10 per student per year. We’re not talking about sums that would bankrupt anyone, that would add any true additional burden on students whatsoever. May I add that while it’s just a pizza for them, it’s my mortgage, my groceries, and it’s my car payment. Right now, it’s my dental bill. million in royalties for the copying of published works by K-12 schools. Canadian creators and publishers have suffered under the education sector’s copying policies and practices. I believe politicians and policymakers in Ottawa understand the unintended, negative consequences the 2012 changes to the Copyright Act have brought about. Now, as they prepare their report and recommendations, I hope they’ll remember Sylvia – and the thousands of writers and publishers who are in the same predicament – looking to make their next mortgage payment, book a dentist appointment or pay for groceries. The licence costs are minimal, but the resulting royalty payments make a significant and meaningful difference to Canada’s creators and publishers. • Confirm tariffs set by the Copyright Board are and have always been mandatory. 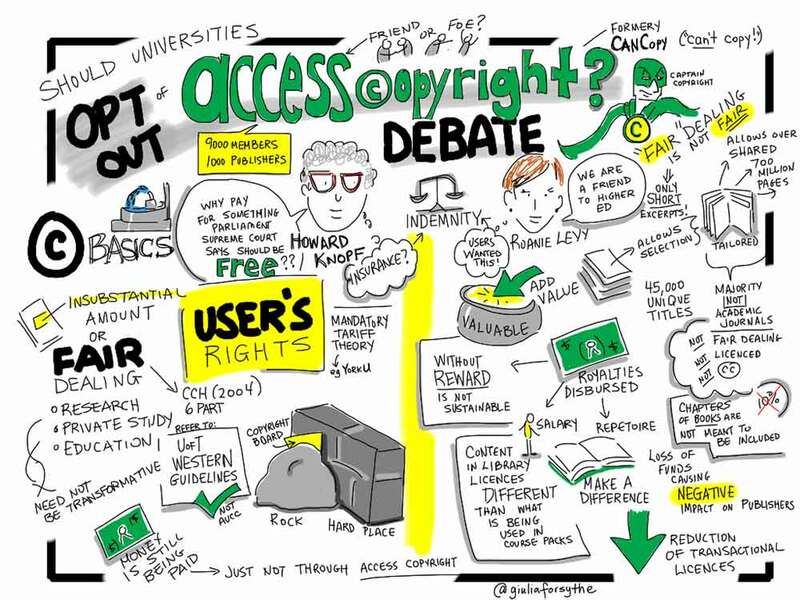 In December, Access Copyright was one of 34 organizations that came together to form The Partnership for the Future of Canadian Stories to represent those who create, read and care about Canadian stories. Collectively, the Partnership prepared an evidence-based analysis to correct misleading claims put forward by opponents of effective copyright to members of the Standing Committee on Industry, Science and Economic Development, and the Standing Committee on Canadian Heritage. In December, the submission was filed with both the INDU and the Heritage Committees. Read it here. • Harmonize statutory damages available to collectives. When creators speak, politicians listen. It’s important we remind the Heritage and INDU Committees of the negative consequences of the 2012 changes to the Copyright Act. It is also vital that they continue to hear this message while they write their final reports. With this in mind, the I Value Canadian Stories coalition will launch a new letter on the I Value Canadian Stories website the week of January 21. We’ll send an email when it’s ready. It will take no more than two minutes to visit the site and send your letter in support of Canadian creators and publishers. In case you missed it…Last fall, the I Value Canadian Stories campaign shone the spotlight on Canadian writers and visual artists. Check out the site’s Videos page to learn more about the work of creators like Andrew Pyper, Amy Stuart, Sky Gilbert, David Chariandy and Jennifer Mook-Sang. Recently, CBC Radio’s The Sunday Edition (hosted by Michael Enright) and CBC’s The National covered declining incomes for Canadian creators and publishers. The segments addressed the unintended consequences of the Copyright Modernization Act for both communities. This entry was posted in Blogs, Business for Writers, The Writing Life and tagged access copyright, Canadian authors, Copyright Act, I Value Canadian Stories, Partnership for the Future of Canadian Stories, review. Bookmark the permalink. Thanks for this post. I’ll eagerly await the information you’ll send along so I can add my name. I am also forwarding this blog to other writers so we can be more emphatic with support. I’ll be adding my voice to this as well and sharing your post. Vital information for creative Canadians! Thanks for sharing. Thanks for keeping us in the loop, Gwynn and Ruth! I participated in the earlier letter campaign, and will join in with this one as well. We don’t have to be starving artists to make lasting contributions — but we do need to be a bit activist if we want to have the bare minimum of resources to create the contributions in the first place! Thanks for doing that Leah. Share this with your circle of artists too. The more the better. Thank you for the valuable update. As soon as I finished this post, I sent my letter from the I Value Canadian Stories website. Excellent, Stephanie! Now if we writers could all do that….